1668 – Serious scientific restoration? 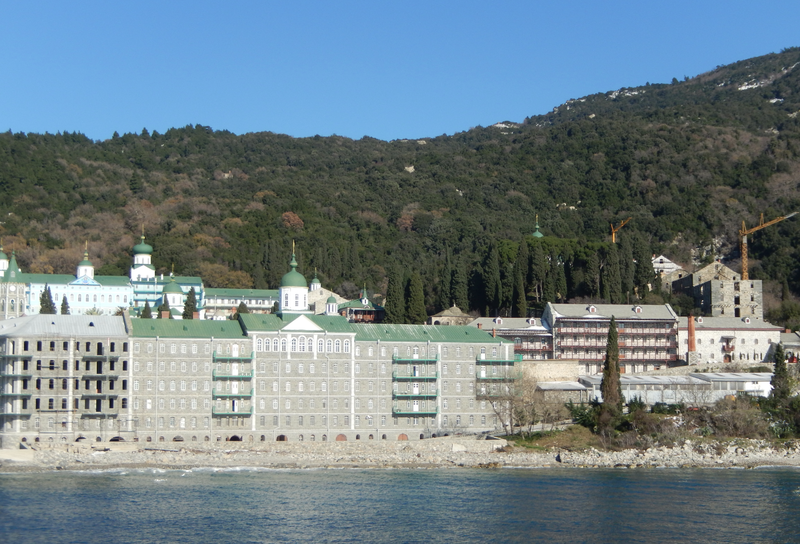 In 2016 the Russians on Mount Athos will be celebrating the 1000th anniversary of its documented history. The Athonite document on which appeared the first signature of a Russian Abbot on Mt. 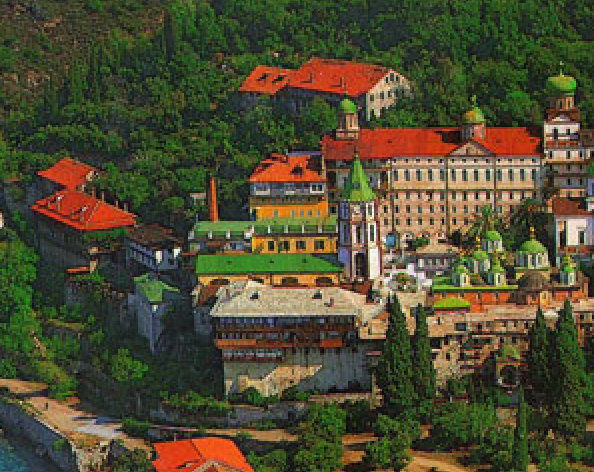 Athos, Hieromonk Gerasimos, dates back to 1016. However, in the judgment of some researchers, there is a historical probability that the history of Xylourgou monastery is older than that date, maybe 989. For years now the Russians are restoring their monastery and skites to present them during the millenium in 2016. They even started to restore the buildings on the right of the pictures what used to be storage buildings. This picture is made in january 2015. The large coastal building in 1997 still partly in ruins. As the buidings on the right in the background. During a meeting in january 2014 in Moscow prime mister Medvedev clarified that the point is to restore a number of buildings, to build roads and to revive some other parts of the monastery. “Anyway, we plan to complete the primary general construction work this year and to carry out the whole complex of restoration work as planned to include the installation of up-to-date engineering infrastructure. We will also have to define a list of facilities to be restored by the millennium and the work to be continued after 2016”, he said. 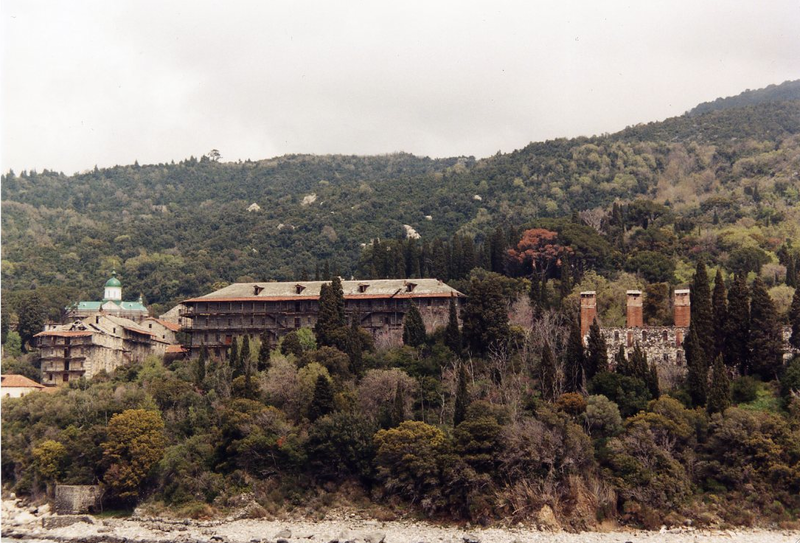 In the 1970ties the condition of the Panteleimonos buildings were very bad. On this picture another look on the storage buildings. (photo by Gerard Koolschijn). But happily a lot of work is done by the Russian and the work is of high quality if we listen to the words of His Holiness Kirill Patriarch of Moscow who spoke on the same meeting as the prime minister in 2014: “to come in touch with shrines and to visit the monastery is of a great importance, really great spiritual importance for people today. 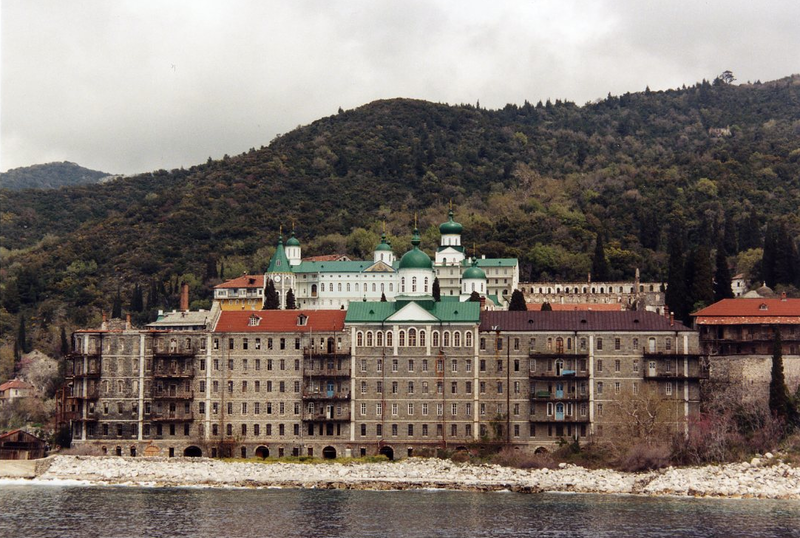 And Russia has traditional millennium-long relations with Mount Athos. 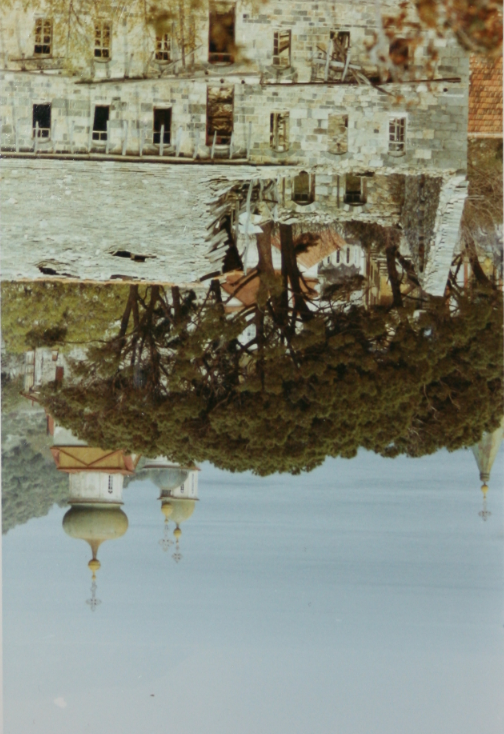 For this reason the Holy Mount is of a very great importance, the more so that Russian monks are present there in St. Panteleimon’s and other monasteries”. His Holiness expressed satisfaction with the progress of the restoration work. “A great amount of restoration work has been carried out on a very high level. I believe nothing like this, namely, serious scientific restoration, has ever happened on Athos, at least in our monastery”, he said. 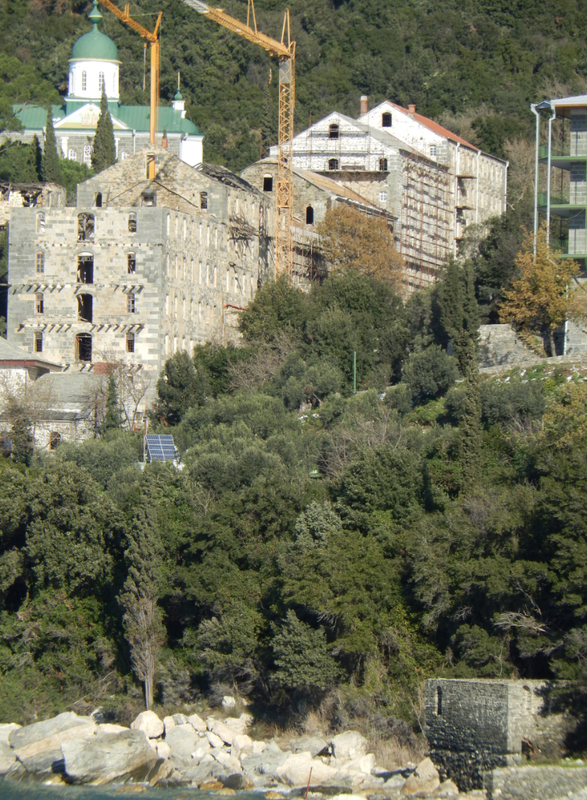 The property to be restored includes Xilourgou, Monastery of the Assumption of Our Lady, Old Rusik and some other monasteries. I have some doubts if everything is done in a scientific way. Some ruined buildings are simply torn down with no attempt to restore them or even rebuild them. Such as the two buildings next to the church situated on the 4th floor. Here the ruins of these buildings which were demolished in 2010/11 and replaced by a field of solar panels. This entry was posted in 19 Panteleimonos, ruins and tagged russians. Bookmark the permalink.